Saturday evening saw sailors and parents enjoying a meal at WPNSA with informative talks by New Chair, Sue Ormerod and ex 29er ace, James Grummett. James gave some valuable insight into his own journey and the transition from the 29er to the 49er. Sunday morning got off to an early start, with some of the sailors caught out by an early launch time and a long sail out to race in the bay. Fortunately, everyone arrived in plenty of time for racing and we got underway on time. The Race Officer had his hands full and it took more time to get through the races on Sunday - due to some larger shifts and the fleet being keen on the line. Consequently, black flags started to litter the results. 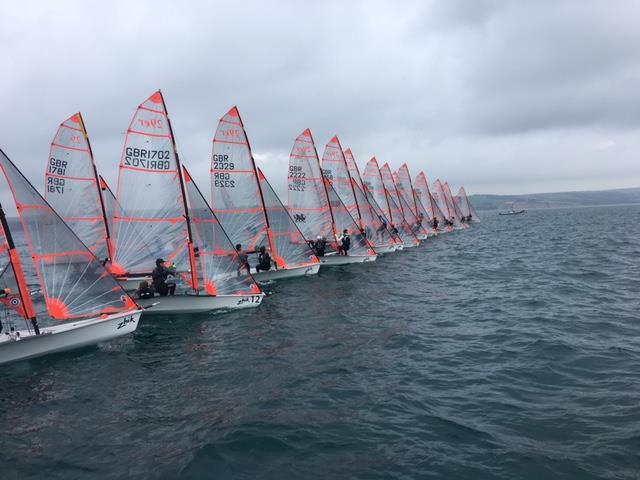 Ewan Luke and Zac Blomeley stormed up the rankings with the best results of the day, but it wasn't enough to stay ahead of Ewan Wilson and Fin Armstrong – they sailed a consistent series to claim the overall win on 22points. Second place was claimed by a very consistent Henry Jameson and Toby Atherton (26 points). Bella Fellows and Anna Sturrock were the top female team, in 3rd (30 points), with Iain Bird and Anna Rowe the top Mixed Team in 8th place overall. Overall it was a really good weekend of sailing in the late September sun. It was fantastic to see some new competitors joining the fleet and we look forward to the next event, GP 2 at Datchet Sailing Club 14th/15th October. Open Training will be held at Datchet the weekend before the GP on 7th/8th October.